The Faith Hardcover Wirebound Journal makes a lovely gift for any occasion. Give the Faith Journal to a woman in your life who is new in her relationship with Jesus and just learning how to put her faith in His plan for her life. Whether she records her prayer requests, journals about her day, or writes a devotion to the Lord, she will practice placing her trust in Christ each time she opens up the Christian journal. The Hebrews 11:1 Hardcover Wirebound Journal features wire binding, a hardcover, and 192 lined pages. 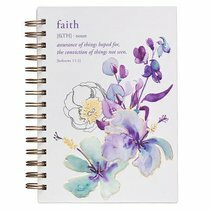 The definition of faith as described in Hebrews 11:1 is displayed in purple text at the top of the hardcover journal, and a beautiful floral watercolor design is featured on the cover. About "Spiral Journal: Faith, Blue Flowers (Hebrews 11:1)"